What’s worse than sweating out a fresh retwist after a workout?! An itchy scalp. In my opinion, after a workout, an itchy scalp is worse because it doesn’t go away unless you’ve scratched out your roots causing sores, scabs, and a mini afro underneath your locs. 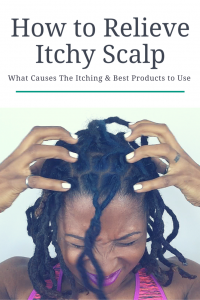 Luckily, I’ve found several solutions for itchy scalp, whether you have starter locs or mature locs, so that you no longer have to suffer in silence. Typically, during a workout you sweat and afterwards you take a shower to wash all the sweat off of your body— but not your scalp. When the sweat mixes with the naturally occurring fungi on your scalp it causes odors and the salt content of the sweat mixed with open pores on your scalp creates itching. The health of your scalp is vital to growing long healthy locs, so you want to always address itchy scalp with a solution and not scratching. Constant scratching of your scalp with locs will eventually cause thinning and breakage from the roots. Instead of scratching your scalp, you can alleviate the itching AND odor causing fungi by using lightweight products with antiseptic and/or clarifying properties. Using lightweight, antiseptic and/or clarifying products after a workout will help prevent product and dandruff build up in your locs as well as control odors. 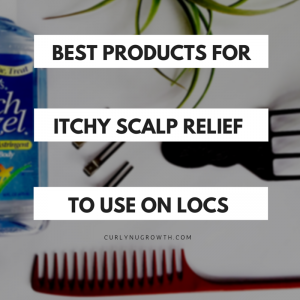 I have listed 3 of my favorite products for scalp relief that are gentle enough for everyday use. Witch Hazel. Witch hazel is a natural astringent and toner that works to remove excess oils, like sweat, and close the open pores on your skin. When choosing witch hazel for use on your scalp, make sure it’s alcohol-free so that it doesn’t dry out your locs or scalp. Pre-Cleanse by Dr.Locs. This solution uses the power of apple cider vinegar to neutralize odors and balance the pH of your scalp while removing build up. Pure Scalp by NuGrowth Essentials. This is an all natural mist that blends of the benefits of witch hazel with essential oils to neutralize odors, soothe the scalp from itching, and prevent fungi that can cause mold or mildew within locs. There are only two ways that I recommend applying a product to your scalp to alleviate itching. Prior to using either method make sure to dry your locs and scalp using a handheld hair dryer or hooded dryer on the low/cool setting to remove any excess moisture that could lead to mold or mildew growth. 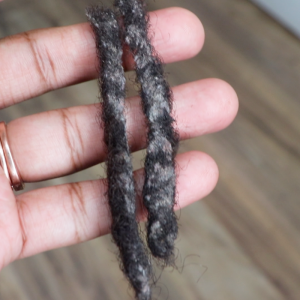 To apply a product directly to the scalp, you DO NOT want to use a cotton ball, Q-tip, or anything that could leave behind lint in your locs. Instead, you want to use a lint-free towel to apply the product because it does not shed and it will absorb the sweat from your scalp quickly. 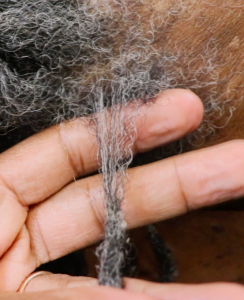 Using this method is good for mature locs they can withstand the rubbing of the product throughout the scalp. To apply products without touching your scalp, you want to use a spray bottle. A spray bottle will allow you to concentrate the product where you need it most. This method is great for quick application or for starter locs that can’t be manipulated too much with the rubbing needed in method #1. You can watch a demonstration of how to use each method on locs in my most recent video “How to Cleanse Itchy Scalp“. Always remember, the health of your scalp determines the health of your locs. It is important to minimize scratching and work smarter, not harder; with lightweight, antiseptic or clarifying products to relieve itchy scalp. Share your favorite technique for relieving itchy scalp in the comments! I’ve had my locs about 7yrs. My hair is very thin in the front area of my head. No other place is this happening except this area. What would u recommend? for a treatment. Its looks like I’m getting bald. I cannot recommend a treatment without more information. Feel free to setup a consultation with me by clicking here. I look forward to speaking with you! How To Relieve Itchy Scalp After Working Out | KinkyCurlyCoilyMe! 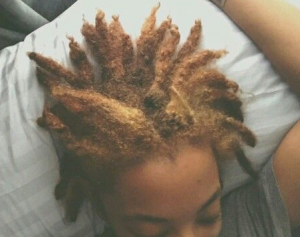 I’ve been on your blog pretty much everyday since I decided to start my loc journey a couple of days ago. I’ve learned so much from your articles ( and YT videos). I used to feel very intimidated by the idea of locs because I didn’t have the knowledge. Now, I feel empowered to take the necessary steps to make this a healthy journey. Keep up the good work! I look forward to receiving my order of Pure Scalp in the mail.